Central offers admission to qualified students as they apply. All applicants must submit a completed CWU online or paper admissions application (the online application is preferred) along with a non-refundable application-processing fee of $50. To apply online, visit www.cwu.edu and click Apply. For freshmen applicants that apply for fall quarter prior to November 1 and have a completed admissions file, the Office of Admissions will respond on November 1. Students that apply and have completed application after November 1 will be notified of an admissions decision within four to six weeks. The priority deadline for fall quarter application for freshmen and transfer students is April 1. Applications received after April 1 will be processed on a space-available basis. For the most current information and admissions deadlines for other academic quarters, please visit www.cwu.edu/admissions. Freshmen applicants (students currently enrolled in high school or high school graduates who have earned fewer than 40 college credits after high school graduation) must send official copies of all high school and college transcripts, as well as ACT or SAT scores, to the Office of Admissions. Freshmen applicants are offered initial admission if they meet a minimum admissions index, which is determined by a formula that weighs high school GPA and standardized test scores in a ratio of approximately 3:1. The formula was developed by the Washington Higher Education Coordinating Board (HECB). For the 2010-11 academic year, the minimum admissions index is 28. Freshmen applicants must also complete the following College Academic Distribution Requirements (CADR) courses in high school. Central Washington University recommends that students take additional courses beyond the minimum to prepare them for university-level work. Present evidence of their completion of the academic CADR courses by submitting an official home-school transcript. Transcripts must be signed by a parent or guardian in order to be official. Provide the GED as proof of high school completion. A GED is not required but may be submitted for eligibility for Federal Financial Aid and to participate in varsity athletics. Submit any official college transcripts (if applicable). Regardless of the number of college credits completed, students earning college credit in high school will be considered freshmen for admissions purposes as long as they do not take coursework after graduation from high school (excluding summer). All home-schooled students will be reviewed by the Comprehensive Review Process on an individual basis. 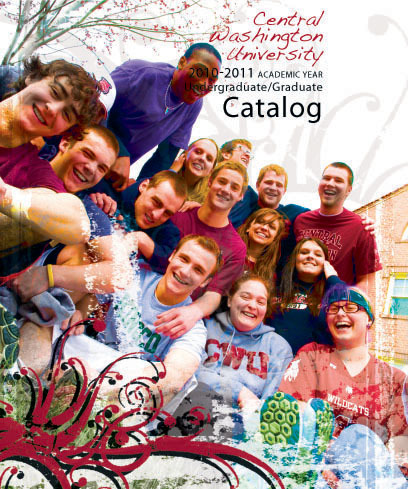 www.cwu.edu/~regi/equivalencies/college_list.html. For current information and application deadlines, visit www.cwu.edu/~admissions. If your GPA is below 2.5 from any previous college attended, you are required to answer the application essay questions, and your application will go through the comprehensive review process. The admissions review committee takes into account your grade trend, the number of transferable credits you have completed, and type of coursework completed, including college-level English and math completion. Central recognizes that many factors affect grades and test scores, so the university utilizes a comprehensive admissions review process. Freshmen applicants whose admissions indices are below 28, or who are missing any of the high school core course requirements, or transfer applicants whose GPA is below 2.5 from any previous college attended, will need to complete the essay portion of the admissions application. The application will go through the comprehensive review process. How have your past experiences influenced your academic record? What are you presently doing to ensure your academic success? What are your academic goals and how will CWU help you accomplish these goals? You are encouraged to include your involvement and leadership contributions in your home, school, or community in your essay. Other students who may be reviewed through the comprehensive review process include those who have not completed high school, earned a General Education Development (GED) certificate, as well as students 25 or older who have poor academic histories and have not attended school recently. Applicants may be required to complete supplemental application forms and/or submit additional information or essays. Central welcomes qualified students from other countries. Students demonstrating the greatest potential for success at the university level may be admitted after a thorough review and evaluation of their entire academic background. Completion of the academic coursework and national examinations necessary to satisfy admission requirements to colleges and universities in their native country. Receive a 3.0 (B grade) in each of two college-level English composition courses from an accredited United States college or university. Contact the Office of Admissions at international@cwu.edu to find out what courses are acceptable. Receive a recommendation from CWU’s UESL Program after successful completion of their highest level. CWU also offers Conditional Admissions to students who meet all of the requirements other than English proficiency. For more information and application materials visit www.cwu.edu/~esl. Students who originate from one of the following countries are considered to have met English Proficiency Standards: Australia, Ireland, New Zealand, United Kingdom, and English-speaking provinces of Canada. These students are exempt from furnishing proof of English proficiency documents. 3. International students transferring from U.S. institutions must have a minimum grade point average of 2.5 in transferable college-level courses and meet the academic requirements for college entrance in their native country. Please Note: Though not required for admission purposes, adequate financial support, verified by the Confidential Financial Statement form and a current bank letter or scholarship award, is required of all international applicants. Apply online. With this option you will submit your application electronically with the online application form and pay your $50 application fee electronically using a credit card. Download and print copies of required application forms. Links to downloadable forms in PDF (Portable Document File) format are found online on the CWU website. Once completed, your forms and supporting documents should be returned to the CWU Office of Admissions in person or through the mail. Request needed forms be sent to your address. Contact the CWU Office of Admissions at admissions@cwu.edu with your request. Once completed, your forms and supporting documents should be returned to the CWU Office of Admissions in person or through the mail. All supporting documents should be sent a minimum of 90 days in advance of the quarter for which the applicant seeks admission. Students who interrupt their CWU studies for one or more quarters (excluding summer) must re-apply for admission to the university and pay the application fee. For more information, check the admissions website at www.cwu.edu/~admissions. If the student has attended any institution during his or her absence from CWU, the student must send official transcripts of all post-CWU coursework to the Office of Admissions at the time they re-apply. Eligibility for re-admission will be based on prior academic performance at the university and any courses completed since last attending CWU. If a student left on academic or disciplinary suspension, they should contact the Office of Student Affairs and Enrollment Management for reapplication instructions 30 days prior to the start of the quarter for which the student is applying. Students who are offered admission to the university must confirm their intention to enroll by paying a non-refundable $100 confirmation deposit before they can begin the orientation, registration, and advising process. The confirmation deposit is credited toward the student’s first quarter’s tuition. If the student does not enroll, the deposit is forfeited. The university will not withdraw an offer of admission for fall quarter until after May 1. Students who have not confirmed may be denied admission after that time if enrollment limits have been reached. Students who choose not to accept offers of admission must notify the Office of Admissions in writing. An offer of admission is only valid for the academic quarter indicated in the acceptance letter. A student who chooses not to accept an offer of admission may reapply for a subsequent quarter. Offers of admission may be withdrawn by the Office of Admissions if a student’s academic work between the time of application and the quarter for which the student has applied results in the student not meeting the admissions criteria. Students who are not seeking degrees or certificates may be allowed to enroll in courses as nonmatriculated students. These students do not need to go through the regular admissions process but should apply through Registrar Services and may be allowed to register on a space-available basis. Credits earned as a nonmatriculated student may not be used to satisfy degree or certificate requirements unless the student applies and is accepted as a matriculated student, in which case a maximum of 45 credits may be applied. Exceptions may be made for non-matriculants in collaborative certificate programs. Students who have previously attended Central as matriculated students and have not obtained a degree, and students who have applied and been rejected for undergraduate matriculated status will not be allowed to enroll as nonmatriculated students. Nonmatriculated students are not eligible for most financial aid, veteran’s benefits, or other services regularly provided for matriculated students. Students who have not yet graduated from high school may be allowed to enroll as non-matriculated students for courses that they need to advance academically, provided that such academic opportunities are not readily available to them elsewhere. To be eligible for the High School Enrichment Program, students must have demonstrated superior academic performance or preparation in the area of study for which they are applying. High School Enrichment Program applicants must submit official copies of their high school transcript. Some courses may require that the student submit ACT, SAT, or COMPASS scores in order to qualify for placement into those courses. In addition, they must complete the High School Enrichment application. They must also meet with the registrar and have the approval of their high school principal and the course professor. The Central Visitation program is a student-run program designed to give prospective students an insight into campus life from a student’s perspective. Our staff is trained to know all aspects of CWU. The staff understands that visiting campus is one of the most important steps in the college decision-making process. Campus Tour: Campus walking tours are offered Monday through Friday at 10 a.m. and 2 p.m. Weekend tours are offered Saturday at 11 a.m. by appointment only. Check the website for a list of available dates. Tours check in at the CWU Welcome Center, are shown where to park, and given a full campus tour. Tours are expected to last at least one hour and 15 minutes depending on the size of the group. Please remember to wear appropriate shoes and clothing for the time of year. Cat Tracks: Cat Tracks is a day-long, comprehensive visit to CWU. This student-run program is a great way to experience campus life firsthand while learning about a specific program. Space is limited so be sure to sign up early. For the most current information, dates, and times, visit www.cwu.edu/~admissions/index.php?page=visit-cwu or call 509-963-1262.